This code sample shows how to setup a camera target and how to create a motion path for object animation. It shows how to manually manipulate coordinats to accurately setup key frames and tangents for the path. It also shows how to display the motion path tangents and curves to facilitate the achievement of a precise result. The code shows how to get the target out of line with the camera. The target here is a light that uses the same motion path as the camera with a slight advance. 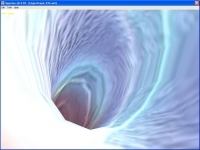 This code sample shows the same features as in code sample 07, but the motion path has been built with 3DCamerPathEditor tool available on http://www.ozone3d.net. 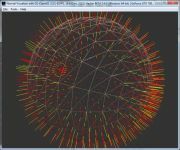 The motion path shows the same parameters such as keyframes and tangents, but those values are automatically created by the 3DCamerPathEditor and then imported into the 3D scene. The camera target is a light and the path has been created in order to get a trajectory inside a winding tube 3D model (torus knot). This code sample shows how to achieve a simple Inverse Kinematic (IK). It shows how to declare different submeshes of a 3D model in order to access them to perform special actions. 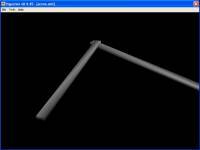 This is done through a LUA scripting code to generate a movement in the ground plane (2D calculus). This code shows how to perform character animation. It shows how to get a good result by setting a simple frame to frame animation. 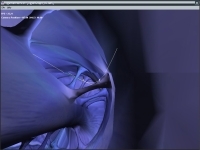 The animation is performed through the LUA scripting code. Bigguy 3D model comes from nVidia 9.1 SDK (Dynamic Ambient Occlusion Lighting demo). ThanX to nVidia! 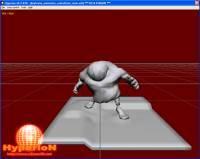 This code shows how to perform character animation. It shows how to get a good result by setting a keyframe animation using a linear interpolation. The animation is performed through the LUA scripting code. Page generated in 0.003119945526123 seconds.